Barack Obama. Shinzo Abe. David Cameron. Angela Merkel. Francois Hollande. Matteo Renzi. Justin Trudeau. The Council and Commission Presidents of the EU and special delegations from Sri Lanka and Vietnam. All of them will be in Japan this week to attend the 42nd G7 Summit at the Shima Kanko Hotel on Kashiko Island, Ise-Shima, Mie Prefecture, Japan. Mie is located in the southwestern part of the Honshu mainland, bordered by the Kii Mountains and the jagged coastline of the Shima peninsula that stretches into the Pacific. 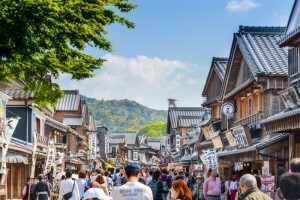 It’s famous for the the female ama pearl-divers and the headquarters of cultured pearl pioneer Kokichi Mikimoto, as well as a variety of seafood and the highly valued Matsusaka beef. Without a doubt, however, when Mie is mentioned, most Japanese will think of Ise Jingu. Ise Jingu is not a shrine; it’s a complex of shrines the size of a town, and one of the three most significant sacred sites in the whole of the country, with the others being Izumo Taisho in Shimane prefecture and Meiji Shrine in Tokyo. 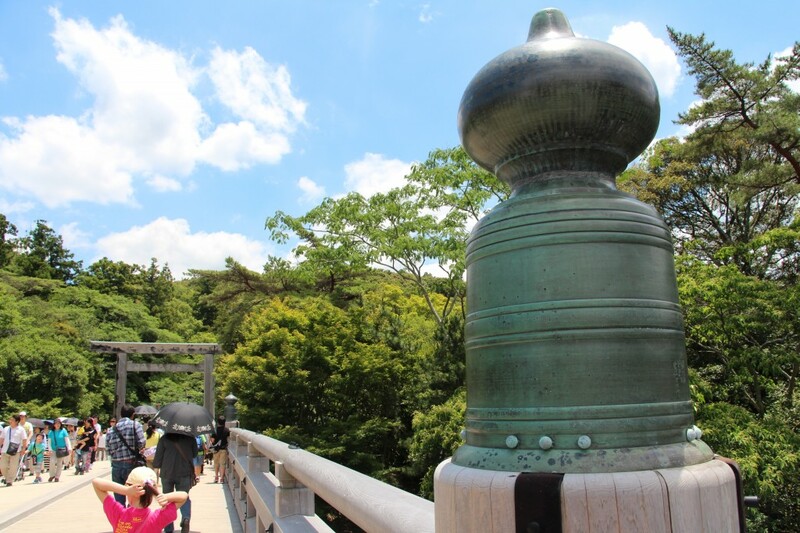 Many, however, would name Ise Jingu as the true spiritual heart of the Shinto religion, and many of its six million visitors a year are pilgrims. 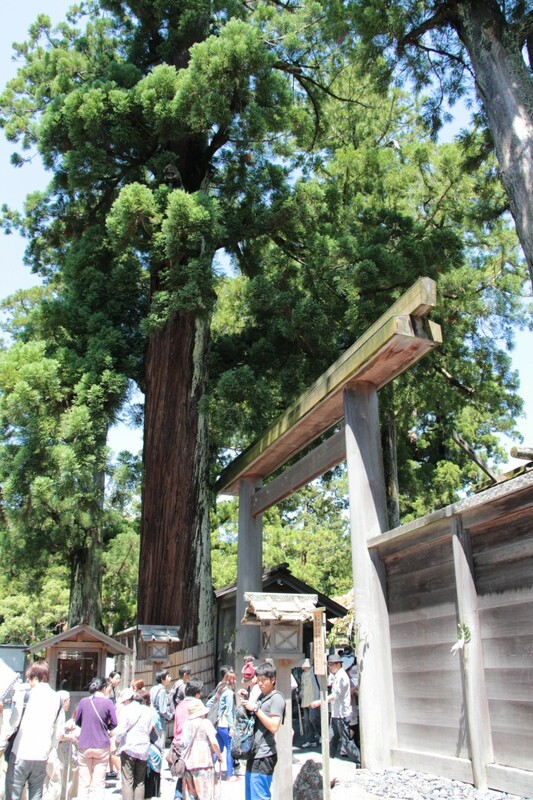 The Ise Jingu complex consists of 120 shrines centered around the Geku (Outer Shrine) and Naiku (Inner Shrine). The Geku welcomes visitors with its market stalls, cafes, and restaurants, and once past the gates the shrines are set in the extensive grounds of Ise-Shima National Park, filled with ancient-growth Cryptomeria trees and scattered ‘power spots’ – piles of stones where you can place your hand on them and feel the power of the Kami emanating from within. 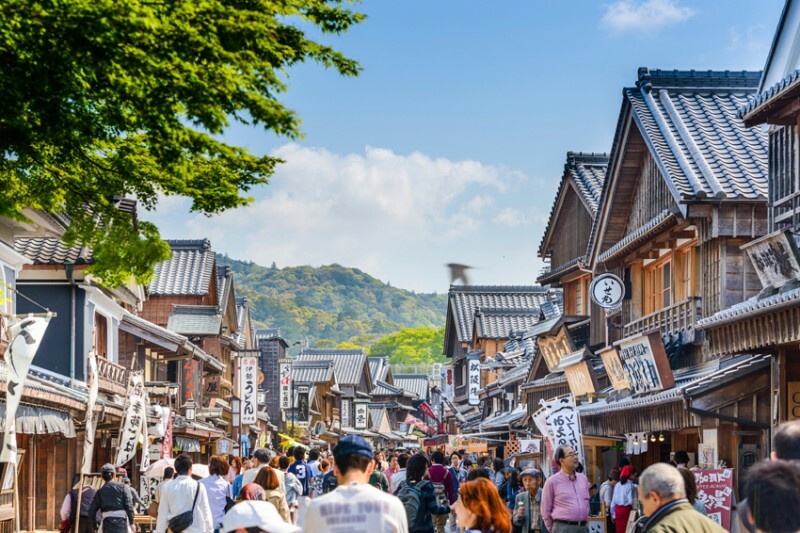 The Naiku and Geku are six kilometers apart, separated by the residential town of Ise, and crossing the Uji Bridge takes you into the Naiku compound itself. Once visitors wash their hands and mouths in the Temizusha, as is standard Shinto practice, they are free to offer prayers to individual Kami at the wealth of smaller shrines, to wander around the Imibiyaden which houses a constantly burning sacred flame, and to purchase talismans and amulets at the Kaguraden, before taking the path that leads to Kotaijingu – the heart of Ise Jingu itself. 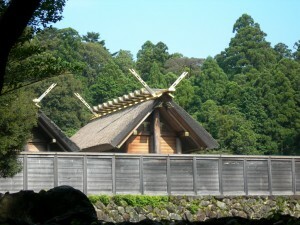 They are not allowed to enter the shrine itself; the most they can see is the roof of the building above a tall wooden fence. Photographs are not permitted on this path, and visitors are not even allowed to walk in the middle of the path; they must keep to the sides. Why so many restrictions? Because Kotaijingu is dedicated to Amaterasu-no-Mikoto, the Sun-Goddess, the mythological progenitor of the Japanese Imperial Family. The Ise Grand Shrine was dedicated to Amaterasu-Omikami. Calling it a shrine was a pathetic understatement; it was as big as a city, with over a hundred and twenty interconnected shrines, and two main buildings – the Naika and the Geku – nestling at the green heart of the complex. 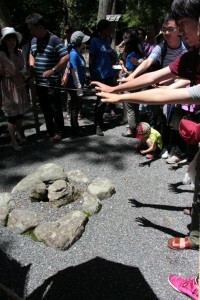 Soon we arrived at the Geku, the outer shrine, dedicated to Toyouke-no-Omikami, the god of agriculture. We had another six ri to go before reaching the inner shrine. We passed along the pilgrim’s road, through the old entertainment district of Furuichi. The samurai ahead were clearing the jugglers, acrobats and conjurers out of the way, shouting at the peasants to hide their faces in the dirt as their lords and masters rode by. After ten minutes the carriages bucked as we rode over the Uji bridge, crossing the Isuzu river. We turned to the right and began to follow the riverbank, passing wide landscaped gardens on our left. from “Voice of the Mirror”, Book 2 of the Sword, Mirror, Jewel trilogy. Until the end of World War Two, it was a matter of national belief that the Emperor was a flesh-and-blood descendant of Amaterasu herself. The Nihon Shiki (Chronicles of Ancient Japan) states that Ise Jingu was established in the year 4 BCE, founded by the divine princess Yamatohime-no-Mikoto as a permanent site of worship for Amaterasu. The Naiku complex was erected in the 7th century by the Emperor Tenmu. 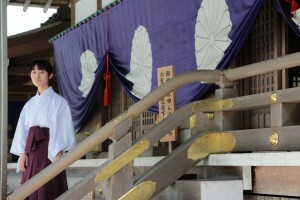 The chief priest or priestess of the Ise Shrines must also be a member of the Japanese royal family. Today, there are two priestesses: the emperor’s sister, Atsuko Ikeda, and his daughter Sayako Kuroda. Kotaijingu is also the home of a sacred object known as the Yata no Kagami – one of Japan’s Three Sacred Treasures, handed down to Jimmu, the First Emperor, as symbols of the Imperial line’s divine origins. The three regalia are the Kusanagi no Tsurugi (sacred sword) kept at Atsuta Shrine in Nagoya, the Yasakani no Magatama (sacred jewel) kept in the Imperial Palace in Tokyo, and the Yata no Kagami (sacred mirror), kept at Ise Jingu. This is what official records state, although the general public are not allowed to see the objects, and no photographs of them exist. The last time they were taken from their respective homes was at the enthroning of the current Heisei Emperor in 1993, but no TV cameras were allowed to film them. Another mystery surrounding Ise Jingu is the strange ritual known as Shikinen Sengu. Once every twenty years, the building of Kotaijingu is dismantled, and rebuilt with new materials (but keeping the original architectural design) a short distance away from the previous site. A festival celebrates the construction of a new shrine and to transfer the Yata no Kagami, and other enshrined artifacts, from the old building to the new one. Residents of the town of Ise participate in a parade to carry the wood along with stones. Each person carries two and places them in sacred spots around the shrine. Shikinen means “fixed year”, and Sengu means “Shrine construction”; the last time this ritual took place was in 2013, so you’ll have to wait until 2033 for the next one. This ritual is by no means unique in Japan; other shrines undergo reconstruction when necessary, and Izumo Taisha undergoes a Shikinen Sengu, every 60 years instead of 20. The Ise Jingu ritual is the most well-known, however, and one that resonates on many levels. On one level, it’s a way to maintain traditional artisan practices, and make sure skills and knowledge are handed down from one generation to the next. On another level, it reflects the transient nature of reality itself, and reminds us that so much of the modern world around us is not physical, but pure information. Where exactly is the money in your bank account or the tracks on your Itunes? Can you see them or touch them? If the main building of Ise Jingu is rebuilt and moved every 20 years, then does it really exist in the physical world at all, or is it simply reminding us that the real spiritual essence of Shinto exists only in the hearts and minds of the people? Considering the G-7 summit, some other questions come to mind. It’s been well-publicized that Obama will make a historic visit to Hiroshima, but will a visit to Ise Jingu be on the delegates’ agenda? Earlier this month, government sources confirmed that Abe plans to show his fellow world leaders around the shrine. This has been greeted by protests from certain quarters. It’s a matter of public record that Abe is a member of the Shinto Seji Renmei, or the political wing of the Association of Shinto Shrines, and he is known to visit Ise Jingu every year after the New Year holiday. An itinerary including the shrine complex would give him another opportunity to air his conservative views to an audience of world leaders. Even the G7 leaders really do visit the sacred site, it’s a safe bet that not even the likes of President Obama will be allowed to enter the abode of Amaterasu, or to set eyes on the Yata no Kagami. 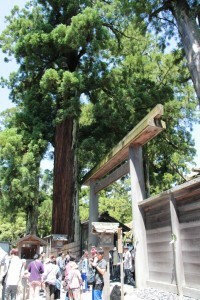 Ise Jingu will remain … a shrine of secrets. There now follows an excerpt from “Voice of the Mirror”, Book 2 of the “Sword, Mirror, Jewel” trilogy. For more information on this epic YA Urban Fantasy series, see the menu above! Tomoe and I nodded without comment. I bowed my head. Of course. Now I understood. “What do the clockwork warriors have to do with it?” Shunsuke asked. “Waves,” said Hokusai with a gasp. “And you have eight million of them?” said Hideaki with a sneer. “Are you aware of what you are saying? That power will burn you to ash, you foolish man,” said Tomoe in little more than a whisper. I could not see the future. I could not see anything. After riding in tense silence for some time, there was a distant shimmer to the right and a low hint of buildings rose like a mirage in the early morning mist. There was bustle in the carriages behind us. “We have arrived,” muttered Shunsuke. I smiled tightly. Lord Naito and Tanaka opened the shutters as the procession reached the outer gates. The guard stood frozen for a second and then dropped to the ground in hurried obeisance. Tomoe touched the sleeve of my kimono. “Lord Naito’s strangeness is growing, Reiko,” she whispered. He nodded, not looking at me. The carriages clicked slowly over the hill and came to rest. The doors opened and samurai came running out with military precision. It was a magnificent site. In the center stood the huge squat shrine, the sun glinting off the polished wood of its walls. The Naiku was constructed of cypress wood. Built on pillars set directly into the ground, the shrine measured eleven meters by five, and included a raised floor, verandahs all the way around, and a staircase leading to a single central doorway. The roof ridge was supported by two central columns – stylized forms of old storehouse building techniques that predated Buddhist architecture. The common folk were not allowed this sight. Only the nobility was allowed this far; wooden fences screened off the Naiku, and common pilgrims were only allowed a glimpse of the tiled roofs of the central buildings. The door opened, and a priest appeared, short and slender and wearing a kind expression. Given his delicate appearance, one could not help wondering how he possessed sufficient vitality to intone Buddhist sutras day and night, year in, year out. “Good morning. It is certainly refreshing outside.” His voice was calm and serene. The priest’s voice was still tranquil, but I could sense the shadows, the cold and the cruel darkness, rushing upon the shrine to overwhelm it. Lord Naito gestured, and one of his samurai rushed forward and cut the priest down where he stood. My companions and I stood frozen with shock. Lord Naito would stop at nothing; he would slaughter an unarmed Shinto priest, and he would smile did so. We were dealing with a creature who had divorced himself from humanity entirely. Lord Naito called, “Mirror Squad One. Prepare to advance.” They began to pull the carriages with the clockwork warriors into the inner sanctum. Immediately, I was assaulted by a storm of sensations, a flooding of Ki energy constantly warped and pulled into new configurations by the object in front of me. This explained the strangeness in the invisible lines of the land we had ridden through. The object itself resembled a large, polished glass sphere, and the fact that it hung in the air without visible support came as no surprise. Storm clouds of moving, shifting shapes and patterns, in colors I could not describe, moved across its surface, indicating that something dark and brooding lay within. It was a sight that only the Kamisama were meant to see. I felt sick, and my limbs trembled, as if I stood on the edge of a bottomless pit. Lump armpit delivers inconvenience, hurts when clicking. to Postpone visit doctors is not appropriate. Seal under the muscle cavity may become dangerous disease. However more often it is consequences frequent use deodorants, non-compliance rules personal hygiene, excessive sweating. Redness causes narrow clothing, infected razor-affiliation, the infection. Discomfort under the arm, inflammation, lump becoming hot? This is the boil that will will have to be opened, then take medications. In the first stage treat ointments, antibacterial medicines. If the process switched to second stage, the required surgery.